To say I am enamoured with the music of Andrea Carri would be an understatement ... I am utterly besotted with his particular blend of melodic solo piano & neoclassical expression. I've had his new albums "Chronos" - for a wee while now & am captivated by the ease in which Carri presents a melody. 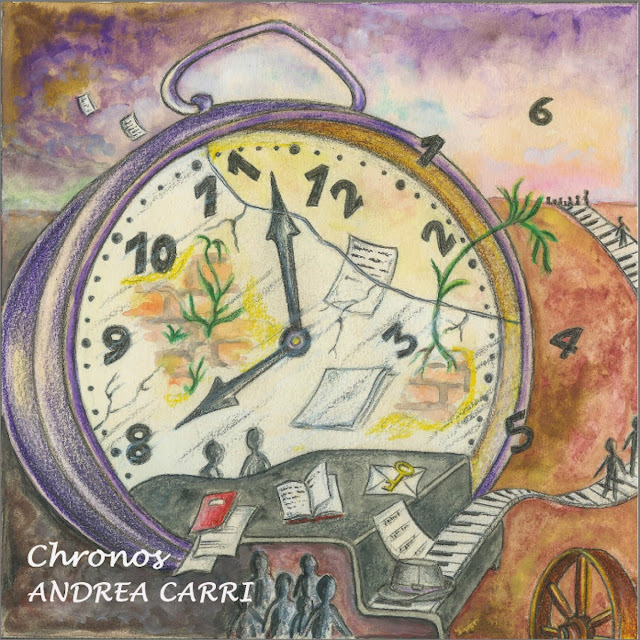 From the opening track - "Time" - to the final bars of the closing track - "Dopo un tax colt one viene un altro" - I found "Chronos" to be a delight: an easily accessible, melodic delight to be precise. The tracks presented - 11 in total - are modern day lullabies for the iPhone set. Carri's piano-playing is effortless and it is in this effortlessness that he excels. Tracks like "la vie delle sette torri" are where he makes it all seem so easy and that, for me, is the sign of a truly talented artist. "Chronos" is an unhurried, uncomplicated expression that points to a place where time tends to slow and graceful, and elegant playing is highly valued. What's more, when Carri broadens his sound, such as on "Present", you get even more beauty ... this time with layers of ambient guitar & bubbling synths. Whilst this is the sign of a talented musician, it is also evidence of someone who is intent on bringing beauty into this world and Heaven knows we need all the beauty we can get! Carri does get more 'experimental' near the end of the album, with tracks like - "Music is Eternity" - featuring heavily the violin and cello from Carla Chiussi & Emanuele Milani respectively ... and "Future" with Jarre-esque soundscapes to complement the piano. These experiments are the gravy on the pie ... and something I would readily welcome more of. Other guests that are involved on this recording include Roberto Porpora on electric guitar and sound effects, Francesco Mantovani on synth and pad, and Perry Frank on lap steel, soundscapes and visions ... together with Carla Chiussi & Emanuele Milani ... and Carri himself they make "Chronos" something very beautiful indeed!